As some of you know, in addition to being Webmaster for this site, I’ve also been Webmaster for a few genealogy sites. 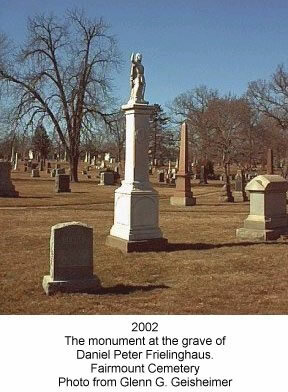 Because of this I’ve learned some good tricks to trace your ancestors. Using these methods I have traced most of my ancestors in Newark. My mother’s paternal side is the focus of this story. Her maiden name is Frielinghaus and she is the fourth generation in the United States. Her maternal side goes back to 1700 in Maryland, but that’s another story. 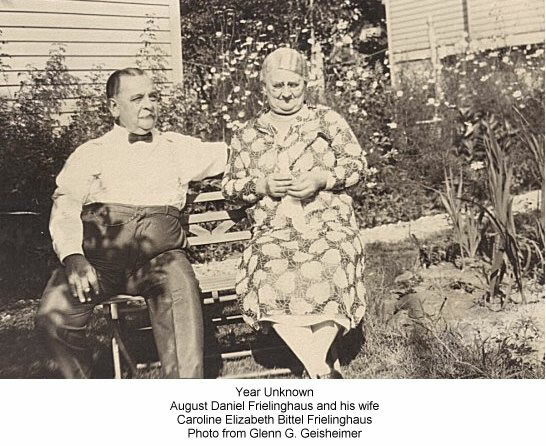 The first Frielinghaus in her line to set foot in the United States was Daniel Peter Frielinghaus and he came to Newark at the age of 30 from Lennep, Rheinland. Why he came I’ll probably never know, but he came to Newark. He lived mostly in Newark for 20 years until his death in 1873. During that time he was a partner in two breweries, one on Springfield Avenue and one on South Canal Street. He belonged to the Reformed Church on Mulberry Street, which was headed by Frederick Lehlbach. He married Elizabeth Decker and they had one child, August Daniel Frielinghaus. August Daniel Frielinghaus was born on December 21, 1863 in Newark. Six years later his mother died and a year later, his father remarries. Four years later, 1873 his father dies. So at the age of 10 both his mother and father had died. To complete the tragedy, his stepmother dies two years after that. At the age of 12 he becomes an orphan. At this point in his life somehow he ends up at Fuerst Institute in College Point, Queens County, Long Island. It is believed that his guardian, Daniel Lauck sent him there. Following that he travels abroad to Alsace to college. For some reason in 1883 he comes back to Newark. Why did he come back? There was no one here for him and he had left the city at a young age. But he did come back to Newark and became an operating engineer for Ballantine Brewery. In 1887 he marries Caroline Elizabeth Bittel and they have 6 children. 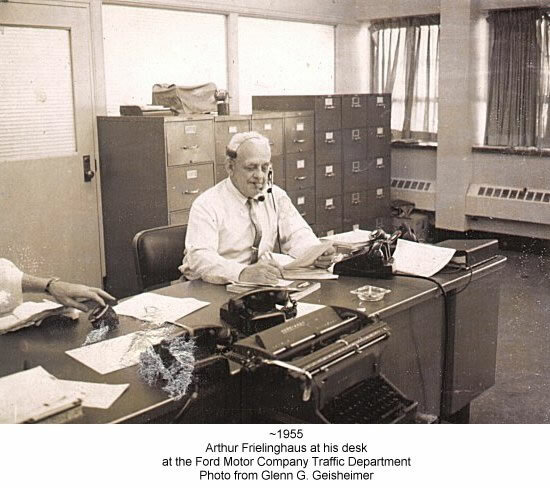 One of those children was my grandfather, Arthur Frielinghaus. Arthur Frielinghaus was born March 01, 1895 in Newark. It’s the following story that leads me to write this memory. 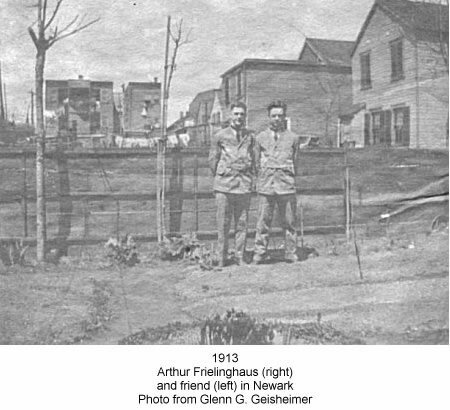 Arthur, at the age of 17, worked in a Pot and Pan manufacturer on Waydell Street. My mother believes it was called Jimmies. One day for some reason my grandfather wrote a note and placed it in one of the pots in a box. What was on the note is unknown. What is known is that it found it’s way to a Woolworth’s 5 & 10 store in Haggerstown, Maryland. A worker there found the note and showed it to a fellow worker, Ethel Nichols. Whatever was on the note elicited a response from Ethel. She wrote back to the address saying that if ever he was in the area he should stop by. A short while later my grandfather and his friend decided that California offered greener pastures than Newark. They hatched an idea to walk to California. Of course, they would pass through Haggerstown on their way. Off they went and they ended up at Ethel Nichols front door. The Nichols had a large house and they were invited to stay the night. In the morning my grandfather woke up to find his friend gone. He had left during the night taking all their possessions. My grandfather was invited to stay. John Nichols, Ethel’s brother, got him a job with the B & O Railroad. After a whirlwind courtship they decided to get married. Permission was asked from both sides of parents and on May 28, 1913 they were married at All Saints Protestant Episcopal Church in Frederick, Maryland. A year later my aunt was born. The following year they had an argument. The result was my grandmother and aunt moving to Newark leaving my grandfather in Haggerstown. He quickly followed them back to his parent’s home on Waydell Street. They decided to stay in Newark and Arthur got a job for the Central Railroad. A few years later my mother was born and Arthur changed jobs, moving to the Ford Motor Company. My grandparents were married for 65 years until my grandmother died in 1978. A whirlwind courtship followed by 65 years of marriage! Why did I write this story? I found it interesting that three generations had their choice on where to live and all three chose to come to Newark.